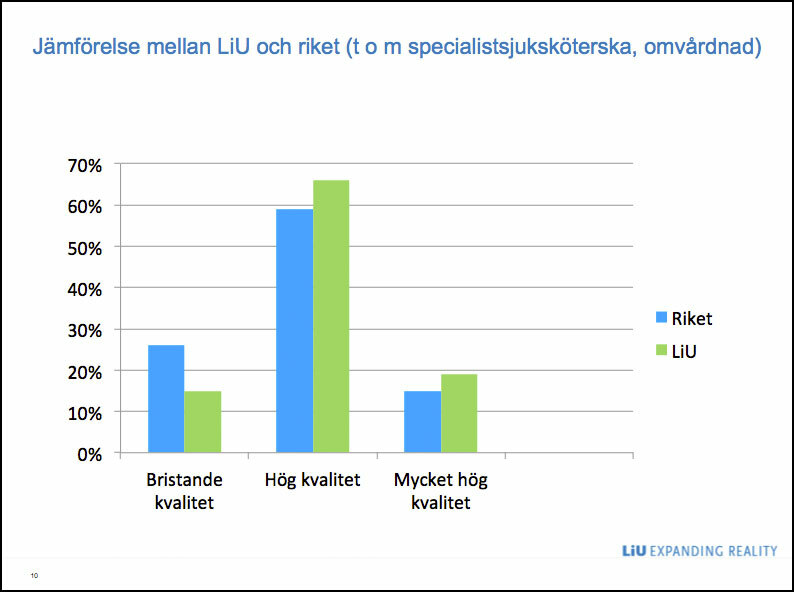 When the Swedish Higher Education Authority (UKÄ) summarises the result of its latest round of evaluation, it will be clear that LiU programmes have come out very well. Between 2011 and 2014, UKÄ carried out evaluations of some 2,100 programmes. Their focus was on the students’ theses and degree projects. “We are doing very well,” a happy deputy vice-chancellor, Karin Fälth-Magnusson, points out. The Stockholm School of Economics only has two programmes in there, Chalmers only has engineering programmes and Stockholm University doesn’t have any engineering or medicine programmes in there. 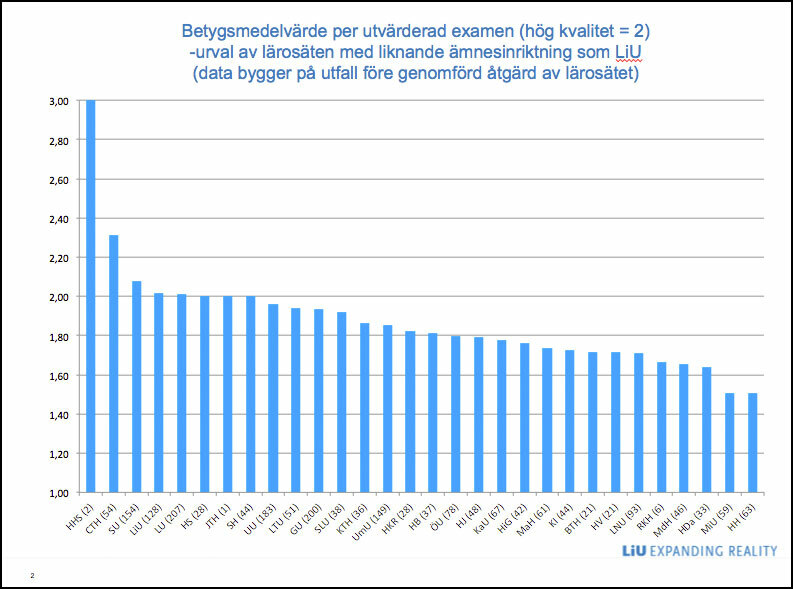 So among the “complete universities” (those offering a full range of courses and research) Linköping is the best with just over 2.0 – high quality, slightly better than Lund University. 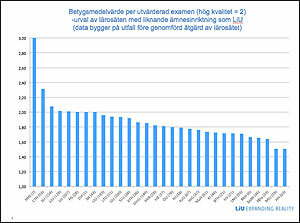 If we compare LiU with the country average as a whole LiU has more programmes assessed as very high quality and high quality, and fewer as low quality. (Diagram in Swedish below right, click for larger image). “The programmes evaluated range across the whole of LiU,” says Ms Fälth-Magnusson. So there are examples of good programmes in each of the faculties. The findings of the evaluation show the university with a certain financial surplus. But it is not easy to use this money, as it is linked to the number of students, and the universities do not know how much they will receive from year to year. The money can therefore not be used for more places in courses, but more for technical equipment and the like. Despite that, Ms Fälth-Magnusson maintains that the students benefit from the evaluations. “For us as a major national recruiter, having programmes of the highest quality is an important factor,” she says. The evaluations have received some criticism, however. 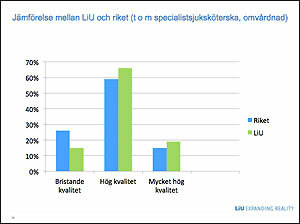 The Swedish Higher Education Authority is now working on a new evaluation system, which will apply from 2016. The new system will try to meet the criticism of the previous ones. For example, the idea that the degree project is not equally relevant in the different programmes, and particularly not so in the vocational courses. The evaluation cycle just completed has included about half of all the programmes, which means that small universities and colleges were not included; the evaluations do not reflect the whole picture. Another criticism is that the evaluation teams carried out very different evaluations. To begin with the universities and colleges did not receive feedback regarding what was wrong with the programmes; they were therefore not able to make improvements.